Wash the chicken breasts well. In a sufficiently large pot place the chicken breasts in sufficient water, a little salt & bring to a boil. Skim off the scum which rises to the top. Boil till the water runs clean & the chicken is tender. Test if the chicken is cooked through by inserting a knife through it. Alternatively you may cut the breasts in smaller pieces & boil. If there is any stock remaining in the pot then strain & reserve for soups or gravy if desired & transfer the boiled chicken to a bowl. Let the chicken cool completely. Shred or chop the chicken roughly & pulse in a food processor/grinder till fine with celery . Transfer the contents to a bowl & combine well with mayonnaise, mustard paste, fresh cream, grated cucumber, salt & pepper. Blend well to form a fine thick paste. Your chicken paté is ready to prepare fresh sandwiches & rolls. Apply a thin layer of butter evenly on both the slices of bread. 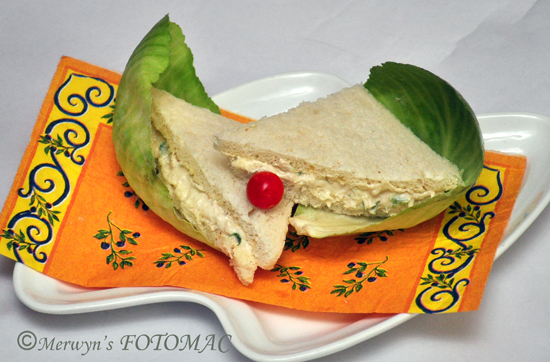 Spread the prepared chicken paté thickly & evenly on both the buttered slices of bread. Club together with the filling & prepare a sandwich. Make sure to cut the edges of the sandwich neatly & evenly using a sharp knife or with a pair of kitchen scissors. Then cut into triangles or squares & serve. Note : The highlight of this sandwich is the grated cucumber. The cucumber helps in retaining the moisture in the sandwich.